Home LPM Voice Is Identification the Missing Piece in LP’s War against ORC? Is Identification the Missing Piece in LP’s War against ORC? Last month, police officers from the Berkeley Police Department in California raided a house as part of an investigation into a retail theft ring and found stolen cosmetics and other goods totaling $500,000, according to news reports. It was a major bust that was, nonetheless, fairly typical—reflecting just how extensive organized retail crime (ORC) has become. The raid was also the kind of score-one-for-the-good-guys story that gives retailers hope they are making progress against a stubborn enemy. But the extent to which a feel-good police raid denotes a genuine victory largely depends on whether there is a way to identify where the stolen products originated. Without identification, prosecuting and disrupting fencing operations could be difficult and impracticable, victim retailers may not recover any products for resale, and the perpetrators of the crime or boosters will feel little lasting deterrence from returning to work. “When you go to seize product, if there is no label and you can’t identify where the product came from, then you don’t have a victim. And you don’t have a crime unless someone can take the stand and say ‘this is mine,’” said Denny Dansak, who until April served as the head of Kroger’s organized retail crime division for all 24 of its companies. Kroger began labeling its high-theft products several years ago to take advantage of improvements in labeling technology made by Avery Dennison. Labels that, if removed, leave a residue or otherwise degrade the product. That technology advancement has created a new class of theft prevention solutions—one that costs just pennies. 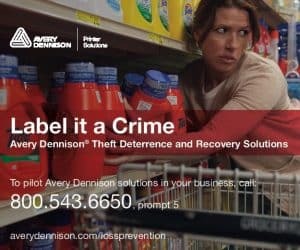 Avery Dennison Theft Deterrence and Recovery labels, which feature numerous types of face sheets and difficult to remove adhesives to work on different kinds of product material, are less expensive than other LP tools. Labor costs are minimal when retailers target their use on high-theft items, or if stores are already affixing labels for other reasons, such as for pricing or promotions. And Avery Dennison’s solutions extend beyond pre-printed store identification and allow retailers like Kroger to include variable information at the time of application to the product, such as store number, phone number, date, and whatever else LP finds useful for recovery. Thus, eliminating the need for hundreds of pre-prints that have to be ordered and warehoused. In addition, they can be combined with pricing or promotion labels and used to improve product appearance and enhance store branding. Recovery is the most obvious value of product identification. If a retailer can show that they own products seized in an investigation—a pallet, for example, of Tide detergent—they can recover it and potentially make it available again for sale. However, even if products are consumable or otherwise unable to go back on store shelves, identification yields value by strengthening criminal cases against fencing operations, which cuts into ORC operations. “Cutting the head off the snake can put 40 to 60 boosters out of business,” said Dansak, who added that ownership identification not only helps to secure convictions but can—for instance by demonstrating when stolen products have traveled over state lines—increase charges and penalties against fencing operators. In addition to providing low-cost theft deterrence, labeling solutions also account for a hard truth about ORC—that 100 percent prevention isn’t realistic. “The mentality of many boosters is that they’re going to get the product they’re after regardless of the theft deterrent in place,” be it EAS, video surveillance, or some other prevention tool. However, even when criminals can’t be deterred, identification labels—unlike many other LP solutions—still yield value by providing critical intelligence to retail investigators. For example, when a legitimate retailer finds itself with a labeled product and calls its 800 number and provides the store number from the label, investigators can trace their stolen product back to its original store. Using information gathered from recovered products, retailers can: uncover the type of schemes they’re falling victim to, such as a diversion issue or a refund issue; determine the extent of a fencing operation trafficking their products; and gather the information that law enforcement needs to pursue a case. Dansak says that his real-world experience coincides with recent data from the National Retail Federation that shows ORC poses a growing threat to retailers. And the motivation behind ORC makes it particularly difficult to combat. “It’s is a not a crime of opportunity, but a crime of economics,” he says.